So, where exactly would the money be going for Atlantic Yards? Remember, what was supposed to be a $4 billion project in 2006 (right) would now be a $4.9 billion project (below) , with the arena--after a 50% projected increase in value--going up instead about 22%, to $772 million. The biggest increase is in the housing, but, on a percentage basis, the largest leap is in the category of Miscellaneous. In the 2006 Modified GPP issued by the Empire State Development Corporation (ESDC), the sum was $19.5 million. This year, the total is $92 million. That a more than four-fold increase. 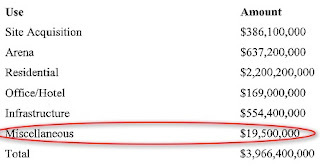 The 2009 Modified General Project Plan, however, went up only 20 percent. I queried the ESDC; spokeswoman Elizabeth Mitchell responded: "The miscellaneous costs include the planning work, environmental work, legal costs and a variety of other soft costs - all of which have gone up dramatically since 2006. The budget in the GPP is extremely broad, and it is possible that some costs got rolled from one category to another - but that would be rather inconsequential seen in the scope of the overall project." They may seem inconsequential perhaps in the scope of the overall project as planned, but perhaps more consequential should it be delayed and/or only a piece is built. 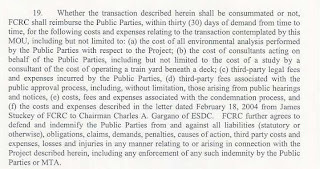 And yes, as the screenshot shows, the 2/18/05 Project Memorandum of Understanding between city, state, and MTA, the developer charges not only its legal costs to the project budget under Miscellaneous, but also the legal costs of the government agencies--and they hire top-flight firms.